Surpassed rugged industry standards: All Land Pride Cutters have been designed and tested to meet rigorous voluntary testing procedures according to ISO 4254-13. 2 3/8" Output gearbox shaft: Large output shaft handles shock loads better. 2 Piece shield on wing gearboxes: Driveline grease zerks are easier to access. Self-leveling hitches: Reduces drawbar wear by keeping hitch level while going through ditches. Adjustable driveline hanger: Serves as a support rest for the driveline when the cutter is unhooked from the tractor. Assist operator when attaching driveline to tractor PTO shaft. Input driveline: Cat. 6 CV or Cat. 5 Conventional: Holds up to shock loads and harsh mowing conditions. Constant velocity (CV) U-joint allows for 80 degree turns without doing damage to the driveline. Drivelines with slip-clutches: RC56 Series: Cat. 4 standard RC66 Series: Cat. 5 standard: Driveline is sized right for the intended cutting capacity. Slip-clutches will slip under load to minimize twist damage to driveline profiles. Grease zerks on end caps of driveline cross journals: Intermediate and wing driveline cross journals are easier to grease. All drivelines have access holes for greasing the U-joints and inner profiles. High blade tip speed: Allows clean cutting of material and even distribution. 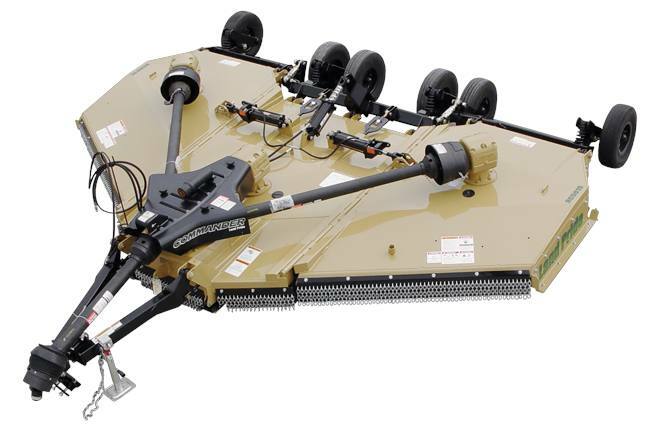 High cutting capacity: Can cut brushy areas with saplings up to 4" with 56 Series and 4 1/2" with 66 Series. Pre-cut chamber: Allows grass and vegetation to stand back up prior to cutting for a more complete cut. Reinforced leading deck edges: Front of deck can withstand heavy brush and saplings. 12" Deck height: Handles heavy cutting, which reduces balling-up of cut material under the deck. 10 Gauge smooth deck top: Reduces accumulation of debris and is easier and faster to clean. 7 Gauge smooth deck bottom: Heavy deck design holds up to harsh conditions. No bottom obstructions. Replaceable 1/4" side skirt: Reduces debris piercing possibilities. Can be replaced if damaged. Left wing rotates clockwise: Better discharge of material. Picks up tractor tracks. 3/16" Stump jumper backed with a 1" thick mounting bar: Heavy round stump jumper. Can hold up to tough conditions. Hinged wing sections: Allows cutter to follow terrain. 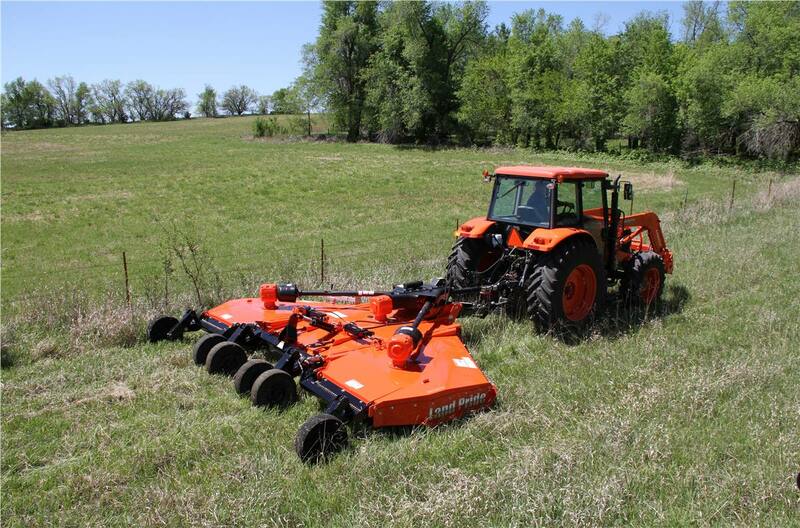 Ideal for rough ground where hillsides, ditches, and hollows can cause uneven cutting. Greasable wing folding hinges: Provides for a long hinge life and allows wings to fold up and down with less stress. 1" Solid hinge rods: Gives greater strength to the cutter from front to rear, and in the hinge area itself. Wing transport locks: Holds transport wings in the folded-up position in case of hydraulic pressure loss. Collapsible 1" leveling rods: Prevents damage and failure to leveling rods. Large diameter leveling rods provide superior supporting strength over rough terrain. Enclosed dual leveling rods: Cutter pulls equally on the rear axle while traveling over rough terrain. 5-Bolt hubs on trailing arms: 5-Bolt hubs makes the wheel assembly more durable and longer lasting. Spring-cushioned trailing arms: Provides independent suspension, cushions loads on drawbar. Replaceable wheel spindles: Wheel spindles can be replaced when damaged without replacing the entire axle. Simply remove one bolt to replace damaged spindle. Roadway light kit option: Allows operator to transport on public roads safer when head lights are turned on and/or when flasher lights are turned on. Deck ring option: Keeps blades from damaging the deck. Machine Weight: Single row chain guards, 6 aircraft wheels, 540 CV main driveline & standard clevis hitch: 5,446 lbs. Cutting Width: 15' - 0"
Overall Width: 15' - 11 3/4"
Overall Length: 16' - 0"
Skid Shoes Wing Deck: Reversible & Replaceable: 2 straight skid shoes and 2 AR400 leading skid shoes. Tire Options: 6" x 21" Laminated tires, 25.5" new tire with or without foam fill, 29" x 16 ply used aircraft tires without foam filling.